THE B-MOVIE NEWS VAULT: Available May 16th: Walter Hill's STREETS OF FIRE gets the royal treatment from Shout Select! Available May 16th: Walter Hill's STREETS OF FIRE gets the royal treatment from Shout Select! WALTER HILL'S CULT CLASSIC "STREETS OF FIRE," COMES TO COLLECTOR'S EDITION BLU-RAY ON MAY 16TH FROM SHOUT SELECT! A friend of mine discovered STREETS OF FIRE about a decade ago and foisted it upon me. While I dug parts of it, overall I wasn't a huge fan. However, now that its gotten some major love from Shout Select, I'm ready to give this "Rock N' Roll Fable" another shot. Synopsis: Amid a brooding rock & roll landscape, the Bombers motorcycle gang, led by the vicious Raven Shaddock (Willem Dafoe, BOONDOCK SAINTS, JOHN WICK), kidnap diva Ellen Aim (Diane Lane, MAN OF STEEL). Her hope for rescue lies with unlikely heroes: soldier of fortune Tom Cody (Michael Paré, BAD MOON) and his sidekick, the two-fisted beer-guzzling McCoy (Amy Madigan, THE DARK HALF). Joined by Ellen's manager, Billy Fish (Rick Moranis, GHOSTBUSTERS), the trio plunges headfirst into a world of rain-splattered streets, hot cars, and deadly assassins. This cult favorite features a razor-sharp cast and original songs written by Jim Steinman, Stevie Nicks, Tom Petty and Ry Cooder and performed by The Blasters and The Fixx. Directed by cult filmmaker Walter Hill (THE WARRIORS, SOUTHERN COMFORT, 48 HRS. ), STREETS OF FIRE is a rock & roll shotgun blast to the senses! NEW! SHOTGUNS & SIX STRINGS: The Making Of A Rock N Roll Fable – A Feature-Length Documentary Featuring Interviews With Director/Co-writer Walter Hill, Producer Lawrence Gordon, Actors Michael Paré, Deborah Van Valkenburgh, Richard Lawson, Elizabeth Daily, Lee Ving, Screenwriter Larry Gross, Editor Freeman Davies, Associate Producer Mae Woods, Art Director James Allen, Costume Designer Marilyn Vance, Assistant Director David Sosna, Choreographer Jeffrey Hornaday, Sound Editor Richard Anderson, Music Producer Kenny Vance, and many, many MORE! RUMBLE ON THE LOT: Walter Hill's Streets Of Fire Revisited – A Feature-Length Documentary Featuring Interviews With Director/Co-writer Walter Hill, Actor Michael Paré, Amy Madigan, and Art Director James Allen. 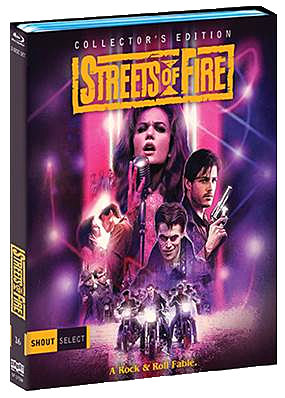 Boasting a new 2K transfer, plus all the extras listed above, Shout Select's STREETS OF FIRE (COLLECTOR'S EDITION) is a must-own for fans of the film! 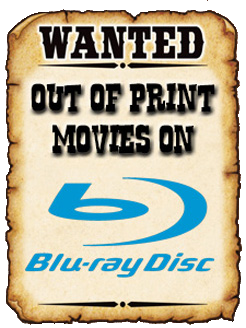 You can order your copy today from AMAZON, BULLMOOSE, or DIABOLIK DVD. But if you order directly from SHOUT! FACTORY, you will also get a FREE 18x24 poster featuring this Blu-ray's new cover art!